I've had a lot of customers email in asking about openSSL heartbleed related concerns after the announcement last week. There is an informational website setup here to explain the issue in detail. First thing I want to say here is that this is information that I've been able to track down, but in no way is this a complete list of everything effected. It is merely a list of items I currently work with that happen to be a part of a lot of my customers solutions. This issue is widespread and evolving quickly so there will obviously be changes to what is listed in this article. 1.0.2 will be fixed in 1.0.2-beta2." Basically this issue allows somebody to grab 64k chunks of data out of memory on a server utilizing OpenSSL. As a result this data could be used to figure out the private key associated with certificates used to secure content. The result of this would be the private key being used to de-crypt a datastream and view what is supposed to be a secure encrypted transmission between two endpoints. Most of the manufacturers are scrambling to figure out a solution to this issue. I will provide some info and useful links to the Vendors we commonly work with to supply our customers with top of the line solutions. 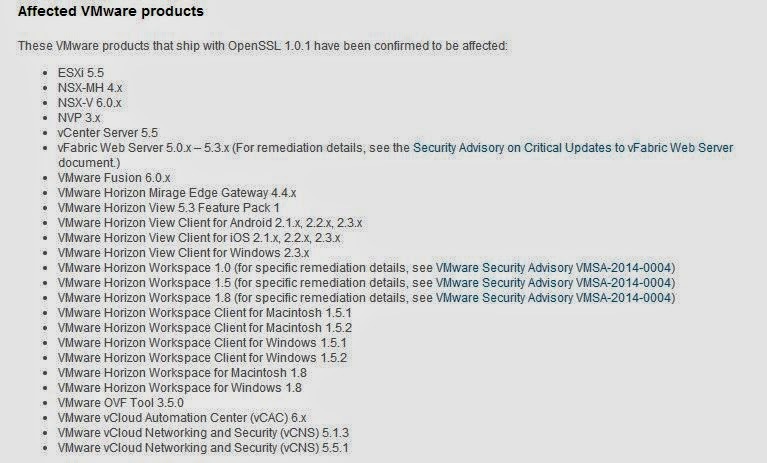 VMware has released information on this issue including which products are affected by the security vulnerability. This official VMware blog post has some info, however you'll want to view this KB article to see the products and info affected. Cisco has also released a statement on this issue as well. They have a preliminary list of devices that are affected, seen below, but follow the link in above to get to the statement. The list will likely changed, they have gone through the entire portfolio yet. Most notably the Cisco UCS platform seems to be in the clear. HP also released a statement, not with much detail, however they have ruled out some of the product line. The statement can be found here. Last, but not least this time is Microsoft. Not surprisingly Microsoft products seem to be uneffected because they don't use openssl typically for anything. IIS, among other secured products in their portfolio, do not use OpenSSL and is therefore uneffected. In closing, I would recommend following the advice of the manufacturer in resolving the issue. Also if you have management devices that are affected that are on a private VLAN don't worry as much about them because you have physical control over who's accessing them. Start with your most public facing devices and work your way back into the network.